I’m all about throw-together lunch and dinner ideas that require very little effort for maximum flavor. Because life gets busy! Between kids school and activities and work and various commitments it can be a real struggle getting food on the table. So this is the kind of recipe that’s great to have up your sleeve for those crazy nights! 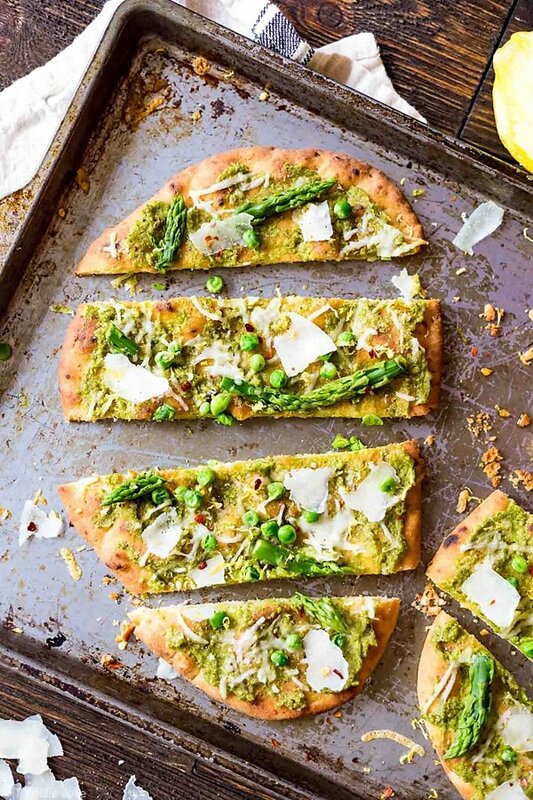 I love throwing together simple flatbreads of all different varieties for my family. My three year old really loves getting to help me assemble them, or as she says “decorate” them. She takes great pride in getting them just right and ready for our family to eat. 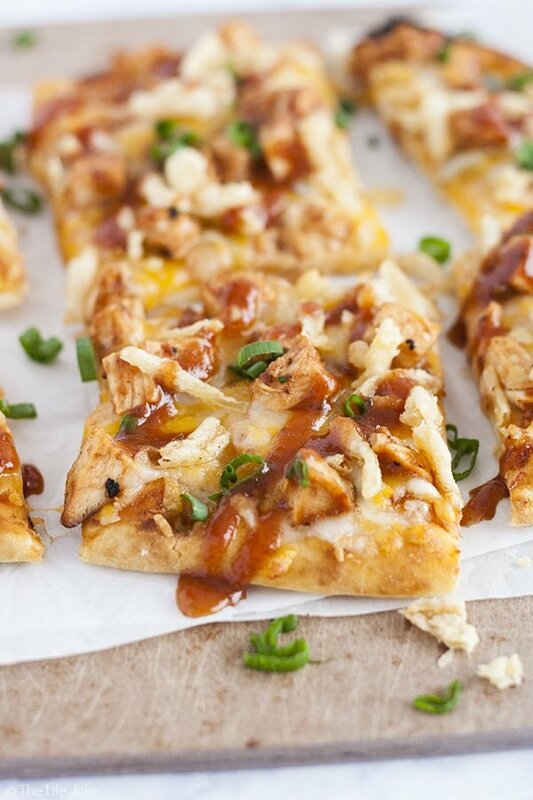 This particular easy flatbread is inspired by my husband, Justin. He is a bit of a picky eater (understatement of the year- my 20 month old has a more extensive palate!!). But two things that he absolutely loves are BLT’s and Ranch dressing. 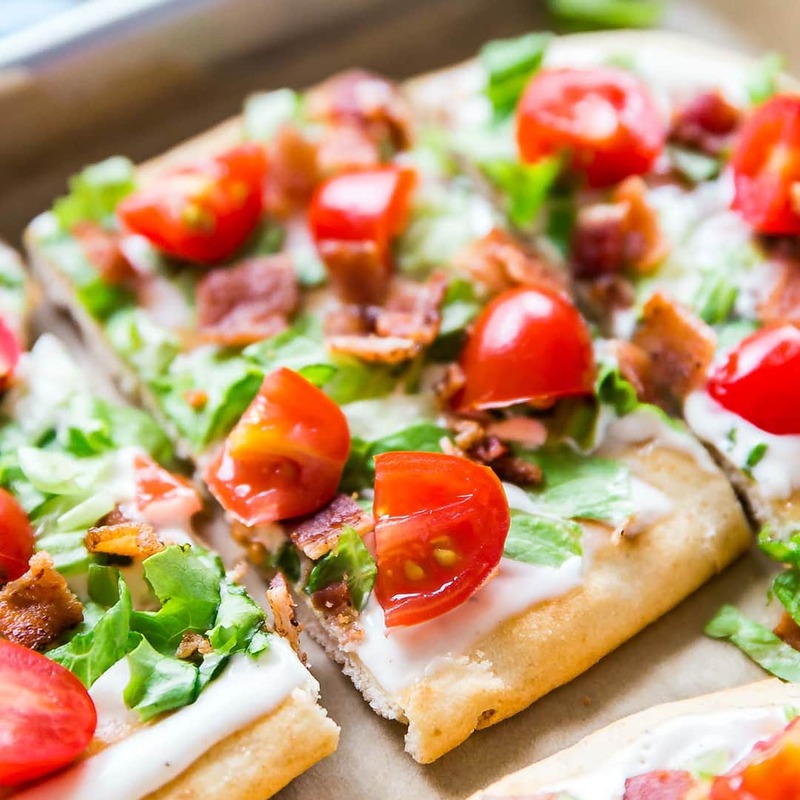 Though he doesn’t often put these things together, BLT’s make a frequent appearance in our meal rotation and Ranch dressing is a staple we always have in our fridge. 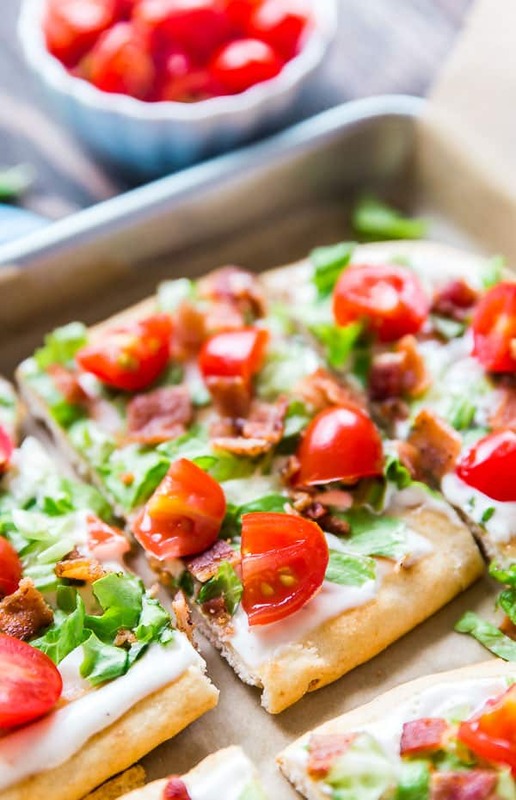 So I figured a BLT Ranch Flatbread Pizza recipe was the perfect opportunity to combine these things that he loves! 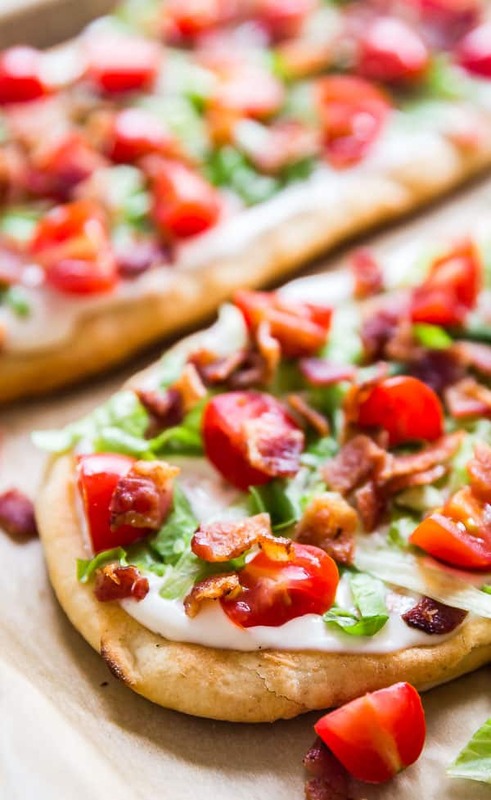 Smokey bacon, crisp lettuce and sweet tomatoes combined with zesty and creamy ranch dressing. All of this served atop flatbreads that have been quickly baked until they’re just crispy around the edges. 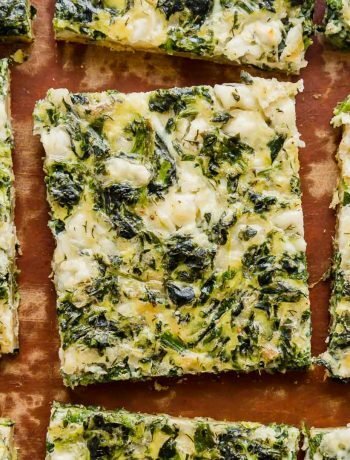 These would be a great appetizer for a party if you cut them into smaller pieces (game day, anyone?). For a fully meal you can serve them with crispy potato chips or along with a cozy cup of soup to round out your meal. They also make a lovely light lunch on their own! You can totally fry the bacon ahead or use up leftover bacon, since these aren’t served hot. I tend to bake the flatbreads and cool them right before assembling but I’m sure you could also do that in advance as long s you cool them fully before wrapping so that they don’t get soggy from the condensation (once cooled, store in an air-tight container on your counter for up to a day or two). Preheat the oven to 400 degrees and line a pan with parchment or foil (for easy clean up). Place the flatbreads onto the pan and bake for 10-15 minutes until the edges brown slightly. Remove and cool for a few minutes. 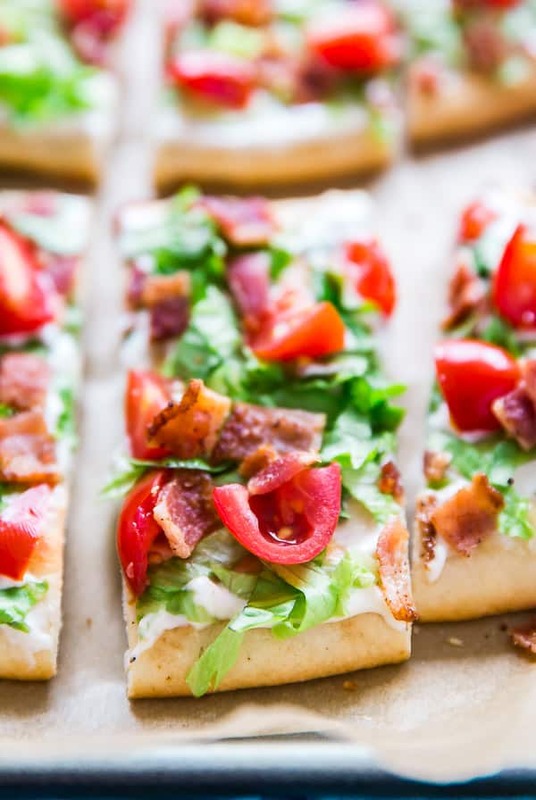 Spread ranch dressing onto each flat bread in a thin layer. Top with lettuce tomatoes and bacon to taste. I left the amounts of these open to whatever is to your taste (for example, if Justin is making this it will be a very thick layer of ranch and tons of extra bacon! ).